BARTLETT LAKE – Lake elevation is 1,774 feet, feet, 68 % full. The water level has dropped 3 feet during the past week and water temperature has been around 68 degrees and falling. Scotter Griffith from The Arizona Fishing Guides said the fishing has been fair to good with high numbers of fish. Some of the bigger fish are being caught on top water. Buzz baits and walking baits are the key. As the sun comes up go to soft plastics Texas rig baits and drop shot in 10-15 feet. Gary Senft, Bass Pro at the the Mesa Bass Pro Shops, fished the lake Friday, Nov. 3 during a full moon. With falling water temperatures, largemouth bass had started feeding more heavily in preparation for winter. Top baits early morning were Rat-L-Traps (great for colder weather) in silver. Other top performing baits were 1/4-ounce Texas rigged brush hogs in watermelon candy and Z-Man Finesse ShroomZ JigheadZ with 4 1/2-inch Roboworms and Powerworms around 9:30 a.m. in 10-12 feet of water. Once the bait hits bottom, work it slowly. LAKE PLEASANT – (Lake elevation 1,670 feet, 65 % full). Carmen from the Hook Up Outfitters previously said water temperatures have been in the low-70s and largemouth action has been picking up as we head into a fall-time bite. Largemouth have been hitting top-water lures such as Zara Spooks, not only during the first light but from mid-morning until the early afternoon as well. A dropshot rig and paddletail swimbaits also continue to be effective for largemouth. Striped bass are primarily in 20-60 feet of water — along with shad — and are mainly suspending on main lake points on drop-offs and can be caught on A-rigs, paddletail swimbaits, as spoons and spin baits. Shad have usually been in 30 feet of water in main lake areas, although sometimes move outside of the northern coves. ROOSEVELT LAKE — (2,111 feet, 57-percent full). Bass fishing on Roosevelt Lake is excellent according to local experienced anglers. The water temperature is in the mid 60s in the morning reaching the high 60s in the afternoon. The 60 degree water temperature is critical because bass are seeking deeper water which is actually warmer during the winter months. When schools of bait fish are found, bass will feed heavily. This creates a unique opportunity for bass anglers to fish an artificial bait that replicates a dying shad. Many bass are in the 40-50 foot depth range, so a jigging spoon or Kastmaster bait are excellent choices to target deep water bass. Two tournament anglers recently reported catching and releasing over 40 bass during one trip. A good fish finding graph such as a Lowrance HD is a great tool to locate bass. When the action is fast and furious, a dying shad bait falling past a bass is irresistible. Look for areas where deeper water is adjacent to a flat with a drop-off. Campaign Bay on the Salt River end of the lake is an example of where the bottom structure meets these requirements. 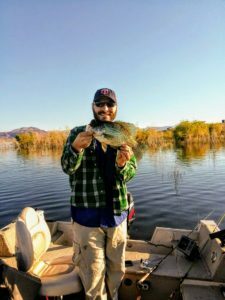 Crappie fishing continues to be reported as excellent on Roosevelt and Apache Lakes. Large schools of crappie recently have been reported in 20 to 50 foot depths. These crappie schools are always near cover. Structural changes, such as a natural ledge or drop-off, are excellent areas to fish for crappie. Anglers are fishing a small crappie jig using a vertical fishing technique. Roosevelt Lake level remains at 57% full. Less than a half foot of water has been released from the lake during November. 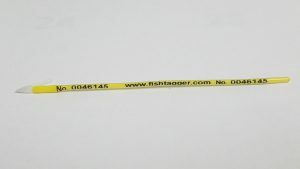 This stability to the water level is a plus for anglers, especially crappie anglers since crapper prefer stable water. The amount of water coming into the lake from the Salt River is at about 50% of the normal flow rate. The Tonto Creek is flowing at about 25% of its normal flow, however, that translates to only about 15 CFS. The lake was stocked with rainbow trout last week. Scooter Griffith from The Arizona Fishing Guides said the lake is putting out numbers of big fish. Most of them have been coming out in the deep grass using a drop shot or a shaky head technique. There should be a decent top-water bite during the morning. Other successful baits reported were walking baits and Ricos and dropshot-rigged Roboworms in 15 feet of water. Yellow bass is an option if the largemouth bass are finicky — jigging spoons deep is an excellent winter tactic here and at Apache lake. Also try nightcrawlers on dropshot rigs. Flathead catfishing also can be excellent. Fish shallow during the nighttime with bluegill or carp as bait. This is the time the flatheads fatten up for the winter. The lake was stocked with rainbow trout the first week of November. Scooter Griffith from The Arizona Fishing Guides said Nov. 22 that the lake is still putting out numbers of big fish. Most of them have been coming out in the deep grass using a drop shot or a shaky head technique. A fishing pier is now open to the public at the Boulder recreation site of Canyon Lake. Trout are stocked in this area. The lake was stocked with rainbow trout the first week of November. Fishing has been somewhat slow during the past few weeks for bass as water levels had increased. The ticket is jigging spoons deep for bass. This is an excellent winter tactic here and at Saguaro Lake, especially for yellow bass. Scotter Griffith from The Arizona Fishing Guides also said the fishing at Apache has been tough but is slowly back on the incline. “Your best bet is to try to find schools deep on spoons,” he said. COMMUNITY FISHING WATERS — Trout returned to Phoenix and Tucson area waters the week of Nov. 16! See more Community fishing news. The program has added two new waters — Show Low Creek and Greenfield Pond. HORSESHOE LAKE – Lake elevation is 1,965 feet (5-percent full). Lake has dropped 3 feet during the past week. When the lake is full, there are a lot of spawning fish. No new reports. LOWER SALT RIVER – On Wednesday afternoon, the river was flowing at 8 cfs out of Stewart Mountain. The river was stocked last week and is scheduled to be stocked again with trout next week. Try nightcrawlers, small spinners, Kastmasters and flies in this unique desert river trout fishery. You might be able to catch some bass or sunfish in the deeper holes. Fishing is good at Show Low Creek meadows at the Show Low Bluff trailhead and Patterson Ponds, which were both stocked with rainbow trout in early November. Brown trout are still active at the Greer lakes, Chevelon Lake, and the East Fork Black River. Overall trout fishing is good at Big Lake, Carnero Lake, Luna Lake, Woods Canyon Lake, and Show Low Lake. BEAR CANYON LAKE – Fishing is good. Rainbow trout were last stocked in late August, but there are still plenty remaining from earlier stockings. And water temperatures are still good for trout activity throughout the lake. Try PowerBait and nightcrawlers. BLACK CANYON LAKE – Fishing is fair. The lake was stocked last in June. The lake is 6.5 feet below spill and the new boat ramp is still fully functional. CHEVELON LAKE – Fishing is fair for stocked rainbows and wild brown trout. The brown trout should be active and can be caught with Z-rays, Kastmasters, or black streamers. Water temperatures are optimum for trout activity throughout the lake. Chevelon Lake is a hike-in lake with a two trout limit and artificial fly/lure only regulations. WILLOW SPRINGS LAKE – Fishing is fair for rainbow trout and tiger trout. Try PowerBait, worms, Kastmasters, or Panther Martin spinners for rainbows, and lures or flies for tiger trout. Water temperatures are optimum for trout activity throughout the lake. WOODS CANYON LAKE – Fishing is good for rainbow trout and fair for tiger trout. Try PowerBait, worms, Kastmasters, or Panther Martin spinners for rainbows, and lures or flies for tiger trout. Water temperatures are optimum for trout activity throughout the lake. FOOL HOLLOW LAKE – Fishing is fair for stocked (12”+) rainbow trout. Supercatchable rainbows (12”+) were last stocked in late August and there are still a few around. Water temperatures are optimum for trout activity throughout the lake. The fishing piers and platforms are accessible. RAINBOW LAKE – Fishing is poor for trout, but fair for sunfish and bullheads. The lake level is very low and the weeds are thick in the shallow areas. The fishing pier is not very useful, since it is very shallow off the end of the pier. SCOTT RESERVOIR – Fishing is poor. The lake level is extremely low and turbid due to irrigation releases. Can’t launch boats from the boat ramp. Try fishing from the shore with chicken livers on the bottom for catfish. SHOW LOW LAKE – Fishing is fair for stocked (12”+) rainbow trout. Supercatchable size (12”+) rainbow trout were last stocked in late August and there are still a few around. Water temperatures are optimum for trout activity throughout the lake. WOODLAND LAKE – Fishing is poor. Fish were last stocked in late-May and there are likely few left. The lake is low and weedy, but the fishing dock is accessible. PATTERSON PONDS – Fishing is good for trout! Rainbow trout were stocked in early November in the upper pond. Channel catfish were last stocked at the end of September. A regular fishing license or a community fishing license is required to fish here. The pond daily bag limits in community fishing waters (2 trout; 2 catfish; 5 sunfish) apply. Please use good catch and release methods if you are releasing fish. BECKER LAKE – Fishing is good. Anglers are catching big rainbow trout on lures and streamers. Becker Lake is open to catch-and-release only for trout, artificial fly and lure only; single barbless hooks only. No bait. No trout may be kept. BIG LAKE – Fishing is good for lots of small rainbows and larger cutthroats. Try flyfishing, lures, or nightcrawlers for cutthroat trout. Some brook trout are also being caught. CARNERO LAKE – Fishing is good for rainbow trout and fair for tiger trout. A recent fish survey found a lot of 14-16” rainbow trout, with the largest topping out at 19”, and several tiger trout up to 16”. The lake is a little low and weedy around the shorelines, but the middle is mostly open water. A pontoon, canoe, or kayak (something that glides over the surface weeds) is best, but a small boat could work by lifting it off and on your trailer, then paddling over the shoreline weeds out to the open water. CLEAR CREEK RESERVOIR – Fishing is poor for trout, but fair for sunfish and bullheads. Sunfish can be caught on a size 12 hook with a small piece of worm, in rocky or weedy areas, or black bullhead on the bottom with a size 6 hook and a half or full worm. CONCHO LAKE – Fishing is poor. Trout were last stocked in April and likely few are left. The lake is low. CRESCENT LAKE – Fishing is fair. The water quality has improved significantly since the summer, but still has somewhat of an algae bloom. A recent survey found good numbers of rainbow trout up to 16” and some brook trout to 14”. The brook trout were all in spawning condition. GREER LAKES (River; Tunnel; Bunch) – Fishing is fair at River, Tunnel, and Bunch reservoirs. The wild brown trout are active and can be caught on lures or dark streamers. Lake levels are still low but coming up slowly as these irrigation reservoirs are filled during the fall and winter. The boat ramps are not usable at River and Tunnel, but the ramp at Bunch Reservoir is usable because this lake is being filled first. HULSEY LAKE – Fishing is fair for rainbow trout. Trout stocked earlier in the year are now active in the cooler water. LEE VALLEY LAKE – Fishing is poor. A recent fish survey found that some Arctic grayling still exist in the lake, but very few, all measuring just over 13 inches. LUNA LAKE – Fishing is good. Although there is a strong algae (diatoms) bloom, the fishing has picked up with cooler water temperatures. Anglers are reporting catching lots of 10-11 inch rainbow and cutthroat trout, and an occasional large cutthroat. EAST FORK of the BLACK RIVER – Fishing is fair for stocked rainbows and wild brown trout. Rainbow trout were last stocked just before Labor Day weekend, but some may still be present. The flows are low and clear. Wild brown trout are active. LITTLE COLORADO RIVER in GREER – Fishing is fair for stocked rainbows and wild brown trout. Rainbow trout were last stocked just before Labor Day weekend, but some may still be present. Wild brown trout are active. There is some skim ice on the pools in early morning. 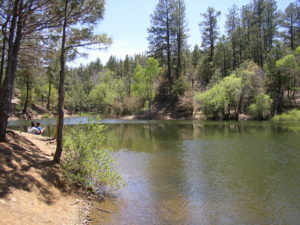 SHOW LOW CREEK MEADOWS (COMMUNITY FISHING WATER) – Fishing is good at this new Community Fishing Water located at the Show Low Bluff trailhead in Show Low. It was stocked with rainbow trout in early November in the Show Low meadow from the Bluff trail upstream to the Hampton Inn. Bait can be used, but daily bag limits are 2 trout, 2 catfish, 1 bass (minimum size 13”) and 5 sunfish. SILVER CREEK – Fishing is good. Seasonal Catch-and-Release regulations (with artificial lure and fly only with single barbless hooks) are in effect and will continue through March 31. All trout must be released immediately and please use proper catch-and-release techniques to ensure the trout survive after swimming away. The upper section is now open. Robert H.: I fished knoll Lake Nov. 16. I caught three rainbow trout sizes 9 to 11 inches on a spinner fly. Early in the morning, had a few hits but after 8 am. No more hits. We did creel surveys on Kaibab Lake on Saturday, Nov. 4 — it was windy and only 6 folks were on the lake. Folks fishing on the opposite side of the lake from the fishing pier were catching trout on worms and PowerBait. Folks on the parking lot side didn’t catch anything. I stopped by Dogtown Lake but didn’t talk to anyone who had caught fish. The wind seemed worse on Dogtown than Kaibab, probably because of the orientation of the lake. No one was fishing City or Cataract when I stopped by them Saturday. We stocked 500 rainbow trout into Frances Short Pond Friday afternoon. They were nice size fish and folks were catching them on lures when I left at 5 p.m. Still getting reports of folks catching trout on Lower Lake Mary. 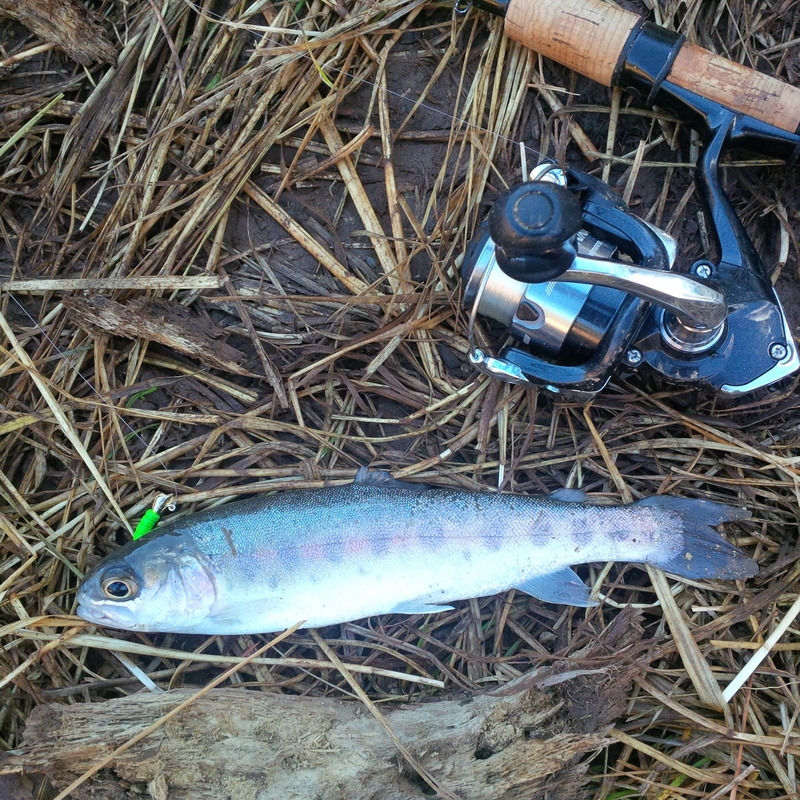 Trout are being stocked weekly and meal worms, nigh crawlers and power baits are working near the stocking sites. Spinner baits are also producing results, especially spinners with red spots. Striped bass and channel catfish are being caught with anchovies and the best lures for stripers include the Long A Bomber or the Savage Gear Glide Swimmer. From a Monday AZGFD creel survey, of the 37 people interviewed, 12 people have caught fish — 26 trout and three nice catfish. PowerBait worked for the trout and worms for the catfish. Small spinners are a must just in case the trout aren’t interested in the PowerBait. Michael W.: Another Great Day Of Fishing At Mingus Lake! In 3 hours, I caught & released 38 beautiful Rainbow Trout, ranging from 7 to 12 inches. All fish caught on 1.25 inch split-tail grub. Key to success, is fish slow. Weather Conditions: Sunny. Water Conditions: Muddy with slight algae bloom. Brandon of Surprise: Fished the north shore of Lynx Lake on Saturday morning, Nov 4th. The bite was slow, to say the least, but managed to catch 2 juvenile rainbows within a 4 hour period. I used chartreuse and yellow Power Nuggets on approx a 2-3 leader. Changed the depth of the cast from close to shore to as far out as I could reach, with very little change in the bite. Summery: Water is simply too warm to reach the trout, that are most likely near the center of the lake, down deep.I will try again in a few weeks. Temps should be down in the mid to high 30’s by then. Hope to find the trout closer to shore. See the details in the full Nov. 22 report from Wayne Gustaveson (www.wayneswords.com). Ryan: Fishing at Alamo Lake is pretty good right now! The lake is up 30 + feet from last year and the fish seem to be responding. They seem to be really fat and happy right now. Water temps are in the low 70s and the largemouth bass and black crappie are biting pretty good. For crappie, troll or drift slowly with road runners or beetle-spin type jigs tipped with live minnows along flooded trees in 17 – 25 feet of water in the morning and evening. The flooded trees with green leaves above the surface seemed to be holding the most fish. We were catching black crappies from 9-16 inches long. While the action is not as fast and furious as during the spawn, I heard several people mentioned you should be able to catch 10 or more crappies per day if you put in your time. For largemouth bass, anything and everything is seeming to work right now. The lake is filled with 8 – 9 inch bass and it seems like they are everywhere. Someone looking to catch 50 fish in a day would have a fairly easy time on Alamo right now. Dropshotting with a Roboworm seemed to work best for me. I didn’t have a ton of luck (and honestly didn’t try that hard) for larger bass as I was trying to get crappie, but I talked to the Park supervisor and he mentioned that for larger bass, he had heard from other anglers that you should be fishing in 15 to 25 feet with various plastics or deep driving crankbaits. YUMA AREA PONDS – Trout stockings return Nov. 16! See the stocking schedule. Thursday, Feb. 16, caught three bass about 12 in. each on dropshot 4-inch worm casting to large openings in weed beds while walking 1 to 1 1/2 miles to right of dock area from 9:15 to 2:30. Caught one 9-inch, green sunfish from a dock on piece of nightcrawler at 3 p.m. before leaving for the day.